Perhaps one of the most beloved and trendiest clothing pieces of the last season. And with all right, the floral midi dress is a perfect balance of being wearable, style-friendly and stylish. It adds the energy with the print, the casualness with the flowy style and wearability with the simplicity. Once you’ve put on your floral midi dress, there’s not much styling to do. Perhaps a jacket to layer with and definitely a pair of shoes, but that’s about it. If there’s one thing beloved clothing pieces have in common, it’s that they’re easy to style! The only thing you should think about is that the midi length can cut your legs short, but go for a neutral pair of shoes as in a subtle color or that they’re open (sandals, ballerinas etc). A pair of heels will also do, of course. You can also just ignore this fact and embrace the edge with a pair of boots! Anyways, I think the floral midi dress is a great go-to clothing piece and deserves a place in your closet! Another go-to piece I think everyone should have in their wardrobe is the pantsuit. I’ve talked about it a lot the past weeks, catch the #Trendalert here, but I think it needs a reminder. A pantsuit works the same way a jumpsuit does, kind of. You have a full outfit that’s ready to go whenever you are. Pick a classic one in either black or blue, or dare to go more bold with a red or a purple one. As I’ve talked about before, the pantsuit is great when you want to dress something up or down. Do it either by a blouse or a t-shirt! 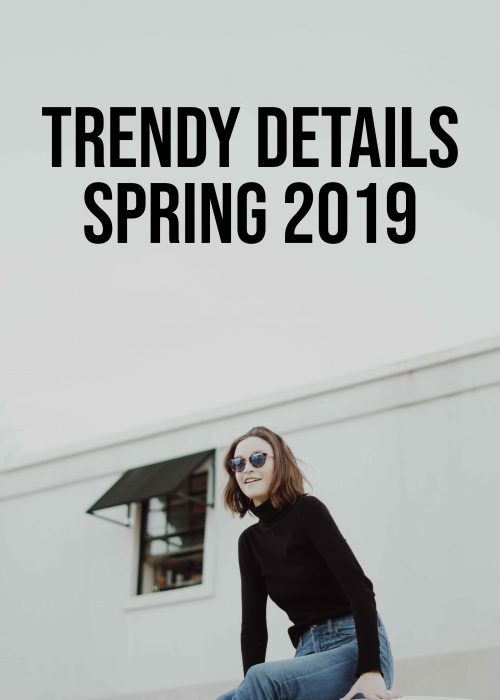 I also mentioned a pantsuit outfit in my article on 50 fashion ideas to try spring 2018! Denim might be an informal material as it is, but you can take it even more casual by going for a loose style. I think this style of jeans, often done as boyfriend jeans or mom jeans, are neutral enough to work with anything your regular jeans goes with. You can favorably contrast the casual style with a preppy blouse or embody it with a t-shirt. It’s perfect when you’re running errands or you just want to go a bit 90s. Do it either with sneakers for the street style vibe or heels to go more balanced. If you dislike jeans, as they can be quite uncomfy with the tight style, this style of jeans are worth a try! Perhaps hats aren’t for everyone, but if you’re a hat lover, working the fedora hat is a must. The simple style of the hat makes it neutral enough to go with a lot of outfits when a hat is appropriate. The structured shape also adds some balance to an outfit if you’re working a flowy silhouette or boho print. The hat is also quite functional when spring arrives as it protects your scalp from the sun, as well as your face. Go for one in black to stay fully neutral or go for one in a color you prefer! A basic clothing piece that’s universally worn by everyone is the white shirt. It’s perhaps a bit more formal than casual, but undoubtedly a piece that’s quite common at work places and when in need of a more preppy style. The structure of the white shirt adds a formal vibe which makes it great to choose when the occasion is more arranged. I do think the white shirt is great however to pair with more informal clothing pieces as it creates a nice balance. Why not try the white shirt with the loose jeans to work a nice outfit of contrasts. Don’t really think I need to say something about the neutrality of the color white, it works with anything, especially with red! If you want to create a more informal style with the white shirt, roll up the sleeves and unbutton a few buttons! The sweater dress is honestly my go-to choice of clothing piece when I want something relaxed. The cosy feeling of the knitwear definitely helps, but also the idea of wearing the sweater as a dress (oh, just be sure that it’s long enough to be considered a dress). 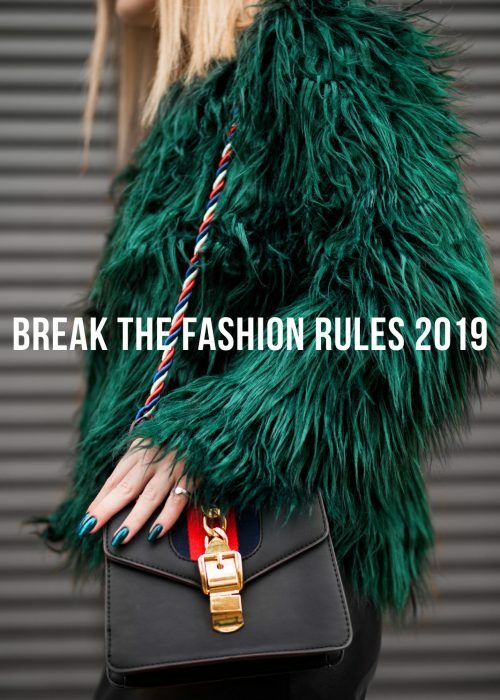 This piece can definitely be worn outside the home if you balance it with more preppy clothing pieces as the cigarette pants or perhaps faux leather leggings. It’s the most obvious go-to when you’re wearing leggings, and also a great piece to layer with during the colder months. Go for a sweater dress in a color you prefer and you’ll have a new friend! Perhaps there’s no clothing piece that’s more associated with the hipster style than the flannel shirt. It’s also a piece that’s connected with fall and perhaps the Holiday season too. I think however that the flannel shirt is a neutral way of working colors and prints in one clothing piece. They are that common that they don’t make that much of a statement and they’re relatively easy to match. Go for a color combination you enjoy and you have a new way of wearing colors without thinking too much about it. Tuck it in your jeans or layer it with a vest! Don’t forget to balance the color by matching it with some accessories! If you only want one clothing piece that embodies the definition of “fresh”, the white jeans are your choice. First of all, enough said about the jeans as they are one of the most neutral clothing pieces you can wear. But going for the white style will open up an endless amount of styling options for you as you’ll have an obvious go to piece when you need to work the brighter shades. You see, sometimes when you’re wearing colors, or a statement print, matching it with black will be too much of a heavy contrast. Especially if the print has a lot of white in it or other bright shades. Instead, the white jeans will ease the outfit and make it look more coherent. They are painful to keep free from dirt though, but indeed a staple that will help your wardrobe! One clothing piece that’s a must for summer is the flowy maxi dress. It’s perfect for beach time when you want to wear loose clothes and it will give your skin a nice break from the sun with the length. A flowy maxi dress is also chic to layer with a crop top or contrast with a fedora hat. I think that going for one in a neutral color will give you a new go-to clothing piece. I have one in black that I’ve worn so many times that it’s almost grey. It kind of has the same effect as the jumpsuit, or the pantsuits, as you don’t need to style it that much. When I don’t know what to wear during the summer, I often choose the maxi dress with a pair of oversized sunnies. Sounds like an outfit of Nicole Richie or so, but you get the simplicity, right?! The final piece in this statement edition is to work the (faux) leather pants. I think these pants can be worn the exact same way you work your regular black jeans, but with the exception that it gives a favorable edge with the material. Therefore, if you think your outfit lacks energy, try to exchange your pants for black faux leather pants instead. Especially if you work a delicate fabric or a preppy shade, the sharpness of the leather will give the outfit something different. This one is also chic to do monochromatic with a faux leather jacket, or match with some denim. Add a pair of boots and you have a new favorite go-to style. To add is that this clothing piece is also chic to do with a blazer as it’s two different styles in one outfit. That sort of clash is always to be strived for! Folks! 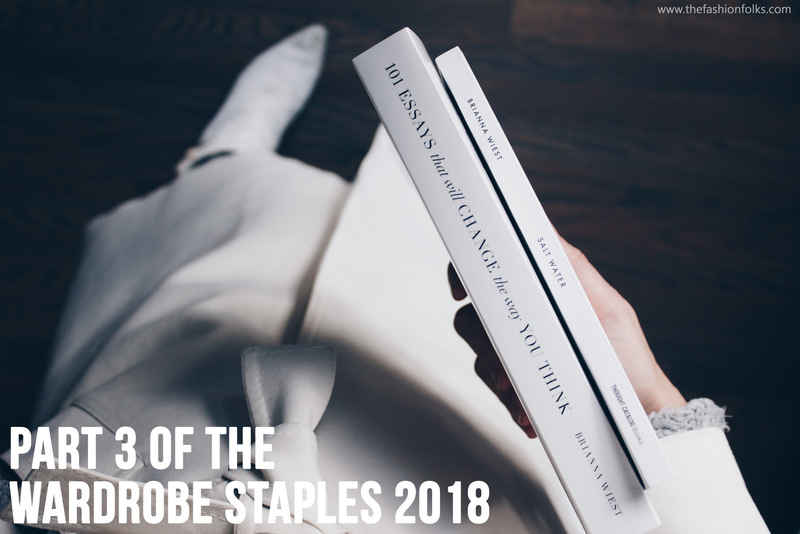 Which clothing piece of the part 3 of the wardrobe staples 2018 is your favorite? Let’s chat in the comments! Yes to all these essentials, but now I need a Fedora Hat, A Floral Midi Dress and Black (Faux) Leather Pants. Great inspo! yes! all the essentials! I am missing a pair of white denim in my wardrobe! Hoping to find one this season! Okay, so let’s please take a moment to appreciate how good that guy looks in that baby blue leather! Loving his swag with it and the way he styled it with the distressed denim. Now, I tend to be a bit picky with flannel because I’ve tried to make some bad ones work and they just didn’t, lol. I love the idea of one that’s fused with a more feminine silhouette, like the one the girl is wearing with the red boots. I don’t know how I’d look with a pair of lose jeans, though I’ve stumbled upon a few pairs that I love the idea of, but haven’t tried on yet. I think there are some great ways of making them work, but the rest of the pieces have to flow with it in a way that makes it work. I love this post because it’s challenging me to step outside the box a bit and rediscover some of my 90s style. Thanks for sharing, gorgeous, and I hope you have a great start to your week! Hello Mia, hope you’re having a nice time! It is always a pleasure to come back to your blog and find such interesting content. 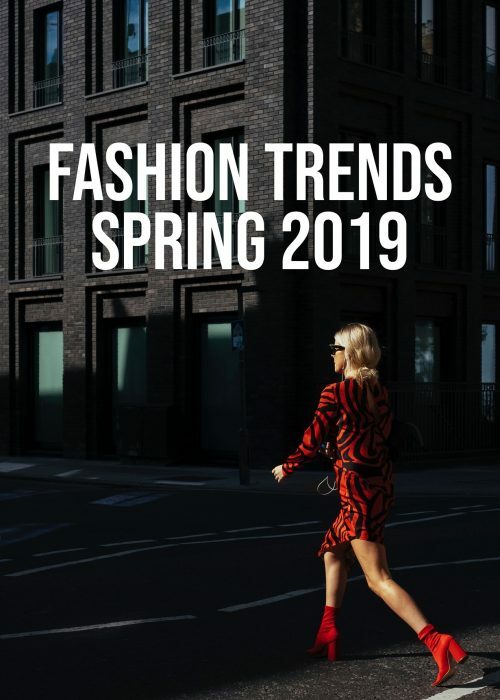 I really like that you managed to sum up the trends of this new season into a list of things/garments that are going to be the next big thing during the upcoming months. Actually I would say that many of this things could be found in our wardrobes and could be used with a quick upgrade/DIY, don’t you think? I still have a fedora for years ago when it was a trend, then I put it on the back of my closet and now it is back again haha, fashion sometimes could be capricious and cyclic, but I really like to see how trends evolve into different things! All the best and I’m gonna check out the other blog posts I missed! These are all definitely fabulous and much needed staples! I need to pull a few of these out since they’ve been hiding in the back of my closet! I really love the pant suit.These are some great outfits. So many brilliant ideas! Floral midi dresses are the absolute best for this time of year and I love your idea of pairing them with either heels or adding edge with boots – all depends on the weather, right?! 😉 Ughhh that photo of Tamara in the white flowing maxi dress is giving me ALL the thoughts of summer haha. So gorgeous!! I bought a lot of dresses recently and I’m looking forward to wearing them in Summer! Well, if it ever stop raining on my side. Okay YES to all of this! Actually, I’ve never considered a flower dress as a staple but it’s so true – I could always wear it! I need to find a pretty, flowy maxi dress, I always love that look on other people. I’m also on the hunt for a looser pair of jeans… I just haven’t seen any I like on me! Jeans are hard to shop for! I’m all for the leather style pants! I also love white shirts too, and floral midi dresses, I need more of those! All amazing staples! I haven’t got many hats I feel like I must try some more this summer! Thanks for the inspo.